Passport valid for at least 6 months is required upon arrival in Laos. Check here for detailed information of passports and visa to Laos. The year round is hot and humid. Laos enjoys a tropical climate with two distinct seasons. The rainy season is from the beginning of May to the end of September, and the dry season is from October through April. The yearly average temperature is about 28°C, rising to a maximum of 38°C during April and May. Medical and dental facilities are mostly operated by the government. Private clinics and pharmacies are available in the major cities.. Medicines from France, USA, Russia, Thailand, and China are widely sold in almost pharmacies. The usual voltage is 220V, 50Hz. The local currency is called Kip. One USD is worth approximately 2,450 kip (1998). Money can be exchanged at banks, authorized shops, or hotels. Exchange rates fluctuate every day, although the fluctuation is minimal. Banks include: Banque pour le Commerce Exterieur Lao, Sethathirath Bank, Nakornluang Bank, Joint Development Bank, and Thai branch banks. Credit cards can be used at major banks, some hotels, restaurants and shops. Light-weight washable cotton or cotton-blend clothes are suitable. A sweater or coat is needed for the winter and in upland areas. As in all Buddhist countries, the Lao people are quite conservative when it comes to clothing and nothing that would be suitable for the beach should be worn somewhere else. In general, showing too much skin is seen as provocative, and it is even forbidden in pagodas to enter if your body isn’t covered from shoulders to below knees. It is also forbidden for women to touch monks, their clothes, or to hand them something directly. It is also considered impolite to show signs of affection in public, especially in rural areas, so refrain from hugging or kissing in the countryside! Lao people are very polite, courteous and it is recommended to adopt the same attitude when addressing to them, as well as to never touch their heads, nor touch or point anything with your feet. The time in Laos is 7 hours ahead of Greenwich Meridian Time (GMS +7). The Laos language is a member of the Tai language group, sometimes known as Tai-Kadai or Kadai. Thai is well understood in Laos, since Lao people watch Thai television and listen to Thai radio. Laos is a tonal language, with six tones - people will find it quite hard to differentiate between the tones, but any attempt to speak just a few words will win you instant friends. It is easy and cheap nowadays to access the Internet and email in Laos. It is available at most hotels, restaurants and cafes. Telephone, fax, telegraph, and telex services are provided at post offices, hotels and business centers. Mobile phones are widely used and it is possible and cheap to buy a prepaid SIM for your unlocked phone or a cheap phone and a SIM card. The Lao National Radio carries news in English, French, and Thai. There are daily TV broadcasts, with two local channels, Thai television and satellite reception. Vientiane-Wattay International is 4km from the city (approx. 20 min. from town). Taxis are available and the rate (approx. US$4 from the city) is negotiable. There is an international airport in Luang Prabang as well with regular flights to neighboring countries. Lao food is mostly composed of sticky rice, eaten with fingers. In the countryside, people will eat together, sitting on the floor, sharing a few dishes. Lao food is dry, spicy and delicious. 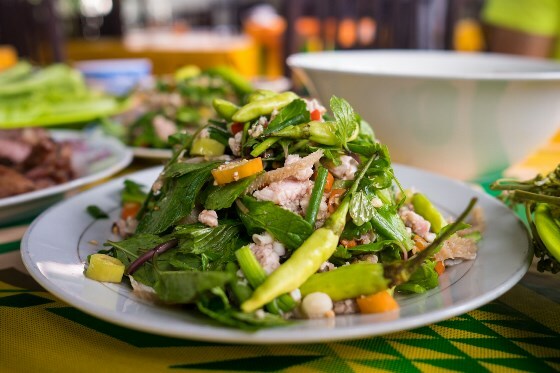 Food eaten in Laos is influenced by its neighbors and by the colonial French period (the bread is an example). Coffee can be found just about everywhere in Laos. Lao coffee is made in a “coffee sock” and is very thick, strong, and dark black. It is served in a small glass with a couple of tablespoons of condensed milk at the bottom. Coffee is always served with a chaser of either weak black tea or warm water. Strangely enough, real coffee is hard to find in hotels and restaurants, where, as in much of Asia, Nescafé and Coffee-Mate are the order of the day. Typical Lao dresses of a low-priced machine-made fabric can be made to order. Handmade Lao silk is one of the most attractive things to buy. The Talat Sao (Morning Market) in Vientiane has dozens of small shops selling 100% handmade silk scarves or wall hangings from US$5 upwards depending on quality, intricacy of design, and size. Beware of cheap synthetic fabrics sold as 'silk' imported from China and Vietnam. Be careful also of 'antique' silk. There is very little left of antique silk, but new fabric can be made to look old and worn. In markets, always bargain: it is expected, but keep smiling.